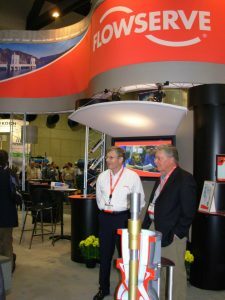 If you have never attended a really large conference, the sheer size of 267,000 square feet of exhibit space is stunning. 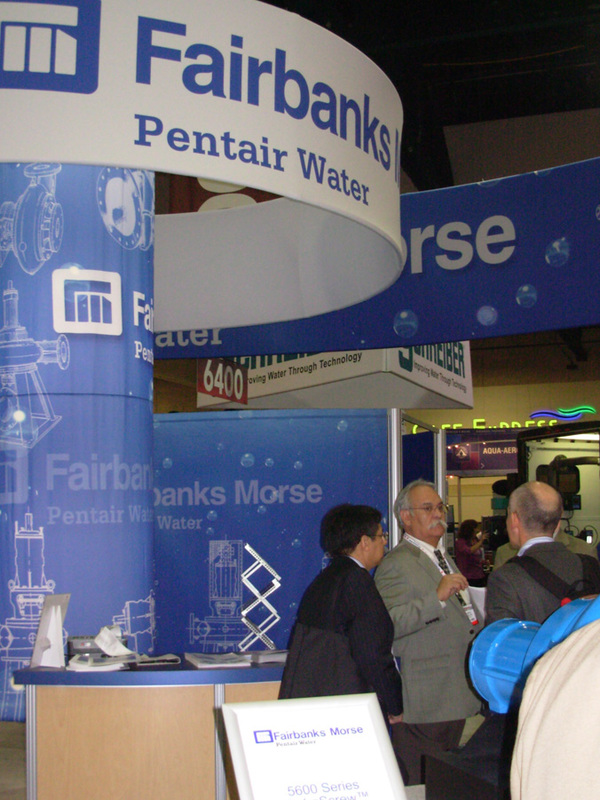 Everything about this year’s WEFTEC in San Diego, Calif. was larger-than-life. 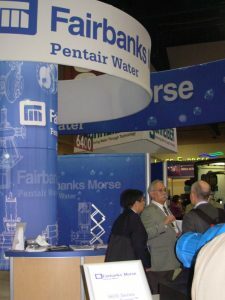 In fact, it was the largest exhibit and educational forum on water and wastewater technologies in the world. The conference, held from October 13-17, featured over a hundred technical sessions, dozens of specialty workshops and eight off-site facility tours. 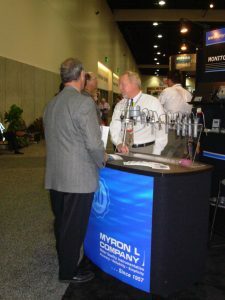 18,000 attendees from all over the globe made their way to San Diego for the event. This year’s theme was sustainability—which, although not a new concept here, is receiving new attention. The first meeting of WEF’s Community of Practice on Sustainability convened on the second day of the gathering and is planning a specialty conference, Sustainability 2008 for June which will feature green practices for energy conservation as well as climate change adaptation for the water environment. Debates and guides to policy development will be offered as well. Outgoing WEF President Mohamed Dahab officially opened the event at the General Session and San Diego’s Mayor, Jerry Sanders, welcomed participants to his city. Technical keynote speaker Dr. Perry L. McCarty, winner of the 2007 Stockholm Water Prize, gave a fascinating presentation urging the audience to adopt more sustainable waste treatment practices while providing an overview of the growth of WEF and of WEFTEC during his years in the industry. A stunning photographic presentation by David Doubilet (of National Geographic fame) brought the beauty of the deep to all in the auditorium. Incoming President Adam Zabinski challenged members to assess water needs in a national effort much as they had 35 years ago with the Clean Water Act. Dr. McCarty was not the only Stockholm prize winner on stage; most of the Junior Water Prize winners were in attendance as well. It was delightful to meet the young inventors in person (see WC&P Oct. 07 by Laura Mirviss): Adriana Alcantara Ruiz, Dalia Diaz Gomez and Carlos Hernandez Mejia from Mexico; US finalists Jordyn Wolfand from Maryland; Kelydra Welcker from West Virginia and Yupeng Liu from South Carolina. US winner Jingyuan Luo from Arizona was unable to attend. All the young winners’ work was on display in the poster session later that day. One of the most interesting parts of WEFTEC is the annual Operations Challenge, where teams from different companies, utilities and municipal agencies compete in the physical activities that water and wastewater systems rely upon. Each team is sponsored by a WEF Member Association or by a recognized Operator Association. The competition is fierce and the teams earn points in a system weighted to reward speed, precision and safety. Events are divided into categories: collection systems, laboratory, process control, maintenance and safety. This year’s winners: Rocky Mountain Water Environment Association’s Commode Commandos; Virginia Water Environment Association’s HRSD G-Force team was a close second, followed by TRA CreWSers from Water Environment Association of Texas. The size and scope of the show and educational offerings is made manageable by a daily newspaper distributed at the entrance each and every morning. While recapping the previous day’s activities, it’s an easy-to-handle guide to the current day’s activities and serves to remind attendees of what is going on at different times and venues within the conference. The first day’s paper also had a wonderful feature: a scavenger hunt. Inviting folks to make their way through the (considerable!) exhibit hall, classroom and workshop areas, the hunt had them go to specific locations, find a particular object and write down answers to questions which the objects contained. Dropping the completed hunt form off for a prize drawing gave the respondent an opportunity to win an iPod nano for their efforts. A nice way to get people to pro-actively wander the event and familiarize themselves with the offerings. The global reuse plenary session was a prime example of the mix that makes this event so exciting. Debbie Best, Deputy Director General from Queensland, Australia; Kay Brothers, Deputy General Manager, Southern Nevada Water Authority; Dr. James Gill, Water Corporation of Western Australia and Chan Kuan Kum from PUB Singapore, each shared their local experience and perspectives on water reuse in a panel discussion moderated by Black & Veatch’s President and CEO, Dan McCarthy. The Australian drought was explained as a long-term decrease: over 30 years, rainfall decreased by over 21 percent. They are moving forward with desalination plants, which are projected to fulfill one-third of supply. Best noted that 1,500 new residents arrived every week in Brisbane, Queenland’s largest city. The current population is four million; 5.5 million is projected by 2050. In Las Vegas, Brothers’ agency is continuing their cash-for-grass WaterSmart landscaping initiative. They ‘buy’ grass removal for $2 per square foot up to 1,500 square feet and a dollar a square foot thereafter. To date, 93 million square feet of grass has been removed through the program. Salinity was discussed throughout this plenary session, notably the rising salt pollution in the Colorado River and the potential implications of that fact. One suggestion was to implement a TDS level of 60 mg/L; remove the rest of the salt and trade it for water. A standing-room-only crowd listened to David Jenkins, Professor Emeritus in civil and environmental engineering at the University of California at Berkeley. From TSS to FISH was the first hour of technical sessions on Monday. He gave several examples of advances in activated sludge process design using molecular biology tools (MBTs) and told the audience that we stand at the brink of a new era in waste management. The folks from IFAT held a gathering to acquaint attendees with this reknowned German trade fair. Perhaps the most important gathering for waste disposal and the environment in the world (the fair includes water, sewage, waste and recycling). Over 2,000 exhibitors from 39 countries and more than 97,000 visitors prove the expertise of the Munich Trade Fairs International Group at bringing the industry together at the crossroads of Europe. Johannes Lohus, the Managing Director of the German Association for Water, Wastewater & Waste, described the show as the only place where all water disciplines meet under one roof. In the main lobby, Water for People’s booth served as a focal point for those seeking to aid parts of the world still without this most basic of human necessities. Throughout the conference, WFP staff moderated sessions on global water challenges. Their annual fundraising event was, “A Taste of Latin America” with the foods, drinks and music from that part of the world as staff members shared their experiences in bringing water to those without it. Attendees were reminded of Black & Veatch sessions (19 in all) through a unique marketing opportunity offered by the setting for this year’s conference: pedicab ads that brought the B&V message to all who took advantage of the weather to walk (or be peddled) around San Diego’s Old Town. AIDIS (Inter-America Association of Sanitary and Environmental Engineering) members from all over the world were present at WEFTEC. Gesner de Oliveira, President of Companhia de Sanemento Basico do Estado de Sao Paulo, Brazil (SABESP); Emilio Rangel, General Director of Servicios de Agua y Drenaje de Monterrey, Mexico (SADM); Abelardo del Valle, Director of Empresa Publica de Medellin, Columbia (EPM) and Jorge Rodriguez, President of the Board and Jose Ortiz, CEO of Autoridad de Acueductos y Alcantarillados de Puerto Rico (AAA) presented an informative session entitled, Water and Wastewater Management in Latin America: Increasing challenges toward an achievable goal. Gretchen McClain, President of ITT Fluid Technology, announced the firm’s new partnership with National Geographic to raise awareness of global water issues. Support will focus on Strange Days on Planet Earth, a two-part television series hosted by Edward Norton. In conjunction with the program, an educator packet of teaching materials targeting middle school students has been created, which will be made available to National Geographic educator newsletter. The partnership seems a good fit for ITT Corporation, a global leader in water and fluid transport, treatment and control technology employing approximately 35,000 people worldwide.